A wonderful thing is happening in home kitchens. People are rediscovering the joys of locally produced foods and reducing the amount of the grocery budget that’s spent on packaged items, out-of-season produce, and heavily processed foods. But fresh, seasonal fruits and vegetables don’t stay fresh and delicious forever – they must be eaten now . . . or preserved for later. 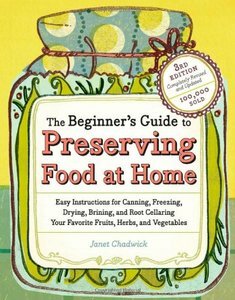 For all the vegetable gardeners facing baskets overflowing with bright tomatoes, and for all the dedicated farmers’ market fans and CSA members, The Beginner’s Guide to Preserving Food at Home has the simple solutions that turn overwhelming bounty into neatly canned tomatoes, jars of jams and jellies, and crispy-tart relishes and pickles. Organized in a friendly, food-by-food format, readers will find freezing, drying, canning, and storing instructions for each vegetable, fruit, and herb. In many cases, several ways to freeze or can a food are described, and there are often other preserving suggestions as well, such as making juice or fruit leather. Everything is written with busy people in mind: these are the quickest, most efficient methods for preserving summer’s bounty. Up-to-date information and clear, step-by-step instructions show even absolute beginners the way to a fully stocked pantry. If you love cooking and want quick-fixing, delicious recipes your family asks for again and again turn to Family Circle for answers to What’s for dinner? This recipe book contains dishes from all over India. Main course fish, meat, poultry and vegetable dishes as well as side orders, bread and snacks, rice and dal, desserts and drinks are included. A guide to spices and advice on all aspects of Indian cookery is included.